Fine trimming and finishing applications in double sided laminate boards, veneers and hard plastics. Eliminates finishing in many operations. 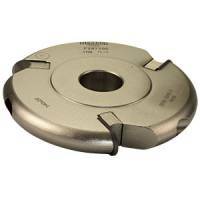 Blade bores stocked are shown in column "B" - click "More info" for details. N.B. Carriage is free to all UK addresses for blades up to 325mm dia. Blades over 325mm diameter will have an additional carriage charge applied for delivery to the Scottish Highlands, offshore islands, Northern & Southern Ireland and Europe. Please contact us for details. 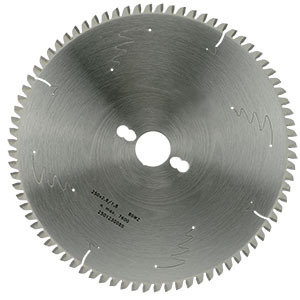 Please note: not all sawblades have universal pinholes and not all universal pinholes will fit all machines. If you need pinholes, please contact us before ordering to avoid mistakes.